The International Space Station is ready to receive more than 5,000 pounds of supplies and experiments packed inside a SpaceX Dragon cargo capsule set for liftoff from Cape Canaveral early Saturday. Ground crews loaded last-minute supplies, including a habitat with 20 mice, sensitive research specimens, and other gear, into the Dragon capsule's pressurized cargo cabin Friday before hoisting the Falcon 9 rocket vertical at Cape Canaveral's Complex 40 launch pad. The cargo's installation Friday set the stage for a final countdown leading to an instantaneous launch opportunity at 2:14 a.m. EDT (0614 GMT), roughly the moment Earth's rotation puts Cape Canaveral in the flight path of the space station. SpaceX engineers planned to oversee the loading of the two-stage Falcon 9 launcher with liquid oxygen and kerosene propellants Friday night, followed by final preflight checks of the rocket and its payload. A terminal countdown sequence is set to begin 10 minutes before liftoff, assuming inclement weather stays away from the launch base. Forecasters predict a 50-50 chance weather conditions will permit launch Saturday, with widespread rain showers and thick clouds the main concerns. Conditions should improve for a launch attempt Sunday if the rocket is unable to blast off Saturday. 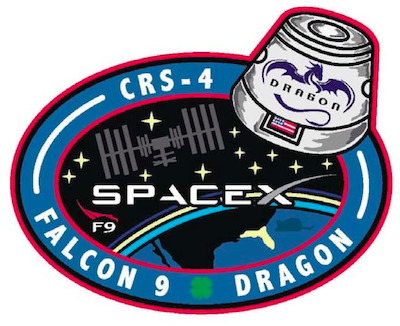 The Falcon 9's two liquid-fueled rocket stages will release the Dragon supply ship in orbit less than 10 minutes after liftoff to begin a two-day pursuit of the space station. The rendezvous will culminate Monday with a laser-guided final approach to the outpost. After the Dragon stops its approach 30 feet below the space station, European Space Agency astronaut Alexander Gerst will snare the spaceship with the lab's Canadian-built robot arm at approximately 1130 GMT (7:30 a.m. EDT). The cargo mission is the fourth flight under a $1.6 billion contract awarded to SpaceX by NASA covering 12 resupply runs through 2016. NASA turned over space station logistics missions to commercial contractors after the retirement of the space shuttle, paying SpaceX and Orbital Sciences Corp. for the unmanned flights. NASA announced Tuesday it selected Boeing Co. and SpaceX to ferry astronauts between Earth and the space station in the next phase of the agency's commercial spaceflight initiative. Hans Koenigsmann, SpaceX's vice president of mission assurance, said the upcoming cargo flight -- known as CRS 4 -- is establishing a more regular "cargo taxi" service to the space station. "The CRS 4 mission has become somewhat of a routine -- I would say a cautious routine -- because we have to be super careful that everything is reliable and working well and checked out and triple-checked again," Koenigsmann said. The gumdrop-shaped Dragon capsule will haul up more than 5,100 pounds of equipment, including a $26 million instrument to measure winds over the world's oceans mounted in the spacecraft's external cargo trunk to be mounted on the exterior of the space station. "I also sense we're doing more and more experiments, we're bringing up expensive hardware," Koenigsmann said. "We know this is transitioning to a routine cargo taxi. I hope we demonstrate all our reliability on time and bring these experiements up in a reliable and safe fashion." If the rocket blasts off early Saturday, it will come 13 days after SpaceX's last flight from the same launch pad at Cape Canaveral, a record turnaround for the Hawthorne, Calif.-based company. Hardware for SpaceX's Falcon 9 rockets arrive at Cape Canaveral from the company's test site in Texas. The rocket stages are initially checked out in a processing facility at Cape Canaveral Air Force Station's industrial area, then taken to the SpaceX hangar at the Complex 40 launch pad for final integration. The acquisition of the Air Force hangar, formerly used by the Delta 2 rocket program, allows SpaceX to prepare rockets for multiple missions at once and avoid a bottleneck in processing at the launch pad. SpaceX also fuels and prepares Dragon capsules and satellites for launch in a nearby high bay built for the retired Titan rocket program. "We have certain things to do, we have certain checkouts to do, and we basically do these on the next vehicle while we are processing the other vehicle in the hangar at the launch site," Koenigsmann said. Saturday's launch would also mark SpaceX's fourth Falcon 9 flight in less than 10 weeks. "The crew is doing a fabulous job on doing these two vehicles in parallel," Koenigsmann said. "In the future, I anticipate this will be the norm. We are ramping up for that launch rate, and actually even more than that." The rapid sequence of missions also puts the SpaceX launch team in a rhythm, he said. "From my perspective, I don't want to say it's easier to do this, but if you launch every two weeks, you still remember what to do from the last launch," Koenigsmann said.